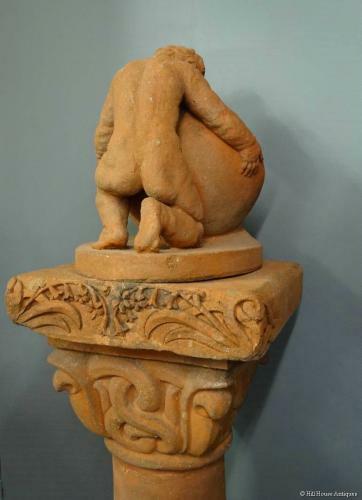 A rare terracotta Compton Potters Arts Guild sun dial, known as the “Cobra Sun Dial”; illustrated in their catalogues at the time; this version surmounted with the separate Compton cherub sundial. The Cobra Sun Dial was available with or without a carved motto; this one is with the carved inscribed motto “gud valsigne dig”; Swedish for "God Bless You". Possibly a unique piece (with the Swedish inscription). A plain grey, lacking carving/motto example is in the collection of the Watts Gallery in Compton, Surrey. Overall combined height: 46”; base 12” square. The plain vertical secton of the column has been professionally restored.